From the creators behind Clock Simulator, comes Hyperide, a pleasantly surprising arcade title that may or may not get you hyped. To dive right into the review, it all begins with a ship was attacked by a pirate vessel. The astronauts on broad abandoned the ship and are scattered through the seven quadrants, and your mission is to rescue them. While playing through Hyperide’s seven quadrants, players will have to avoid debris floating in the galaxy, defeat enemies coming their way and collect pinkonium. Pinkonium is small purple shaped diamonds that can be collected throughout the galaxies. Each of the seven galaxies has a set of missions you can complete as you progress through the voids and can earn you pinkonium, with missions ranging from traversing a certain amount of distance, within a level to collecting a maximum amount of astronauts. Pinkonium can also be collected through vertex portals inside the galaxy. Besides, trying to rescue the astronauts through the seven quadrants, Incursion and Survival are the other two modes supported by the game, with Incursion consisting of the player building a streak for as long as they can and avoiding running into any debris. On the other hand, Survival in some ways is similar to incursion besides the player ship is protected by blue orbs and you have to collect blue orbs to destroy the debris around you to proceed through the galaxy. Both modes are not available to play at the beginning of the game and would have to be unlocked by collecting a minimum of 100 pinkonium each to gain access to these two modes. I enjoyed both of them more than the actual main game mode. Aside from the three modes the game features, The ships may be the “hype” of Hyperide, there are thirteen ships which are available for purchase starting at a minimum amount of ten pinkonium and increasing to five thousand pinkonium. I found that some of the ships are more comfortable to play with than the manual one because you have a smoother move when you’re moving the ship around to avoid the asteroids coming towards your ship. Unfortunately, Just like the ships, you will also have to unlock the other quadrants with pinkonium. The highest amount you will have to accumulate to unlock a quadrant is 500 pinkonium and honestly, that might not look like much to collect but it’s harder than you think and is time-consuming. If anything the game could have used a different unlocking system that makes it easier on the player. Moreover, the game’s visuals and mechanics are considerably good for what the game is worth. I didn’t have any technical problems with the game both handheld and docked. The visuals were classic, vibrant and flowed well throughout the play of the game. Also, the game soundtrack did not live up to my expectations and the music remain the same throughout each of the quadrants. the only thing different about the soundtrack is just when the astronauts talk during times where they might be warning you on what’s coming up ahead but there could be some type of improvement with the soundtrack to attract the player to want to play more. In addition, how you should play the game is up to you, but the controls are pretty good and are easy to learn. as far as what controllers are compatible with playing the game. It’s mainly the Nintendo Switch Joy-Con and Pro Controller. you can play in handheld, docked with the Joy-Con detached or use the Pro Controller. You use the left analog stick to move the ship up and down. 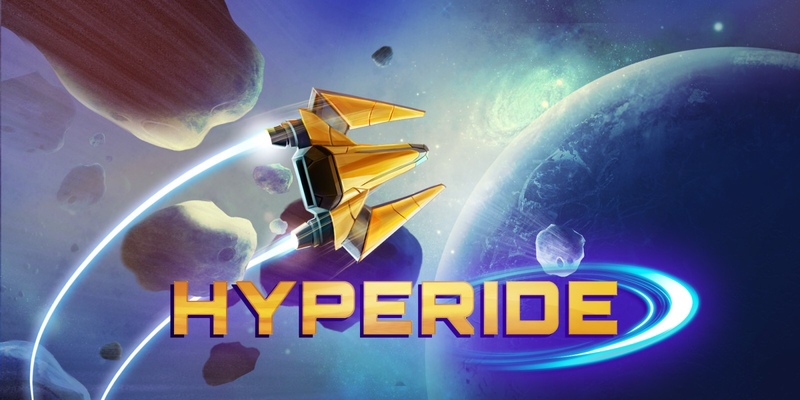 Hyperide is a decent arcade game while it has a lot of great features. For what it’s worth ($1.99,) it is a reasonably great game to pick up just for fun and a game you can play to pass some time, but it’s by no means perfect. There are plenty of areas where the game could have been improved and who knows, maybe those improvements could one day appear in a possible sequel?